Tenacious Taste: Day 9: ROMA! We hit the ground running after our quick flight from Naples. We checked into our hotel, freshened up, and were back out the door to have lunch in the Piazza Navona and meet our tour guide Giuse, pronounced "Juicy", short for Giuseppina. We settled into a little table right on the edge of the piazza center at a restaurant called Tre Scalini. After a long morning, I decided it was definitely 5 o'clock somewhere (probably in Australia) and decided to sip a crisp Peroni. We decided to have a light lunch in preparation for a likely heavy dinner of more delicious pasta and other Italian fare. I chose an all-time favorite, caprese salad, and my mom picked out a nice plate of roasted veggies. Probably the best caprese I've ever had! A great way to get in your veggies! The grape tomatoes we perfectly ripe and burst with flavor in my mouth; the perfect compliment to the creamy fresh mozzarella, aromatic basil, and tart drizzle of balsamic vinegar. The array of vegetables my mom chowed on were perfectly seasoned with fresh herbs and parmesan cheese and had a wonderful grill flavor. After lunch, we met Giuse and headed off on a day of sight seeing. She took us to see some of the preserved ruins of the "original" Rome (modern-day Rome was built on top of the ancient city we all read about in history books). We walked and talked and talked and walked for hours, learning different bits and pieces of Rome's infamous history and observing the bustling crowds around us. 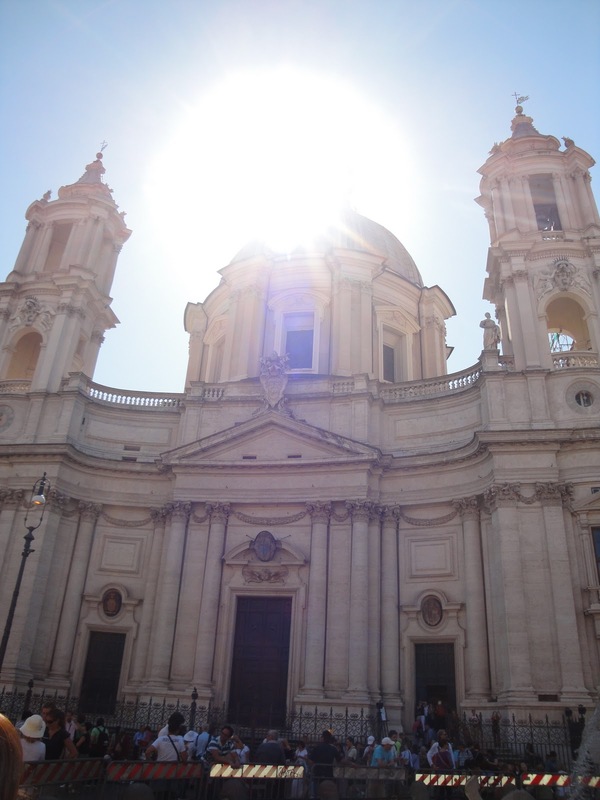 Among the sites we visited were the Fountain of the Four Rivers in the Piazza Navona, the Pantheon, the Trevi Fountain, and numerous baroque churches, one of which was hosting a wedding! Wouldn't it be nice to get married at an ancient church in Rome then drive off into the sunset in a Maserati? I think so! After a long day on foot, we decided to grab dinner at a little hole in the wall family-owned trattoria. Though it was a tad chilly, we elected to sit outside and enjoy the crisp air. The sweet red table wine kept us warm and we ordered two big bowls of pene arrabbiata, which is pasta in a tomato sauce with hot red pepper. It was the perfect meal to end an exciting day. We tapped out early and headed back to our hotel, The Bernini Bristol, to catch up on rest. Even more of ancient Rome was waiting for us in the morning! 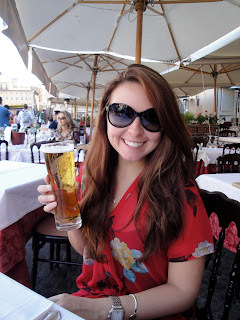 Day 10: When In Rome!